A wholesome satisfying combination of freshly prepared vegetables, blended with wheaten self raising flour and cooked until golden brown in cholesterol free rice bran oil. Very easy to prepare - simply grill, oven, pan fry, BBQ or sandwich press. Delicious served in a hamburger bun, with all the usual toppings and your favourite home made chutney or sweet chilli sauce. 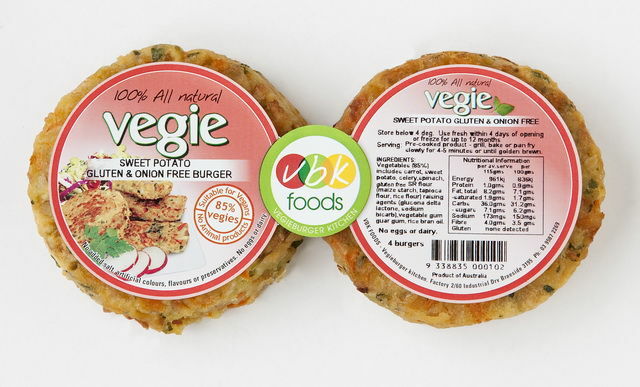 Store vegieburgers in the fridge until the use by date or freeze for up to 12 months. peanut and tree nut free. of peanuts or tree nuts warning because of the combination of spices used. 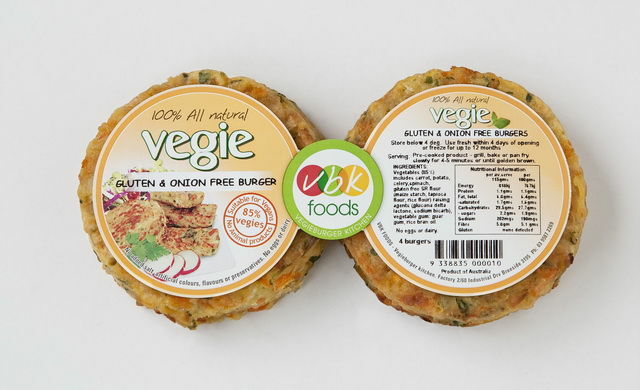 Our Gluten, Onion & Garlic free burgers are a wholesome, satisfying combination of freshly prepared vegetables, blended with quality gluten free flour and cooked until golden brown in cholesterol free rice bran oil. Chilled and vacuum packed for optimum freshness. Easy to prepare - grill, pan fry, BBQ or sandwich press. Delicious served with salad and your favourite home made relish, chutney or sweet chilli sauce. There is no onion or garlic, eggs or dairy, no added salt, artificial colours, flavours, preservatives or MSG and they are peanut and tree nut free. 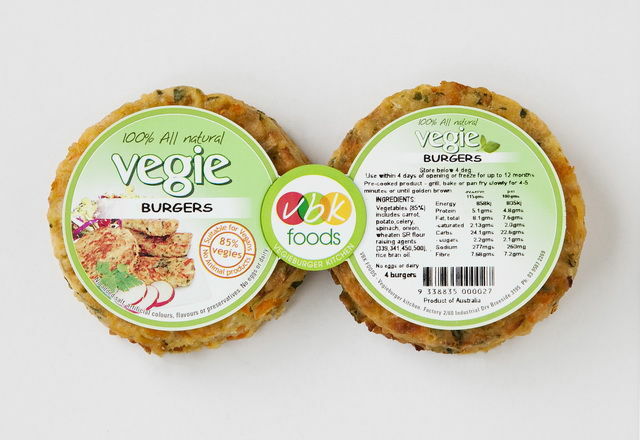 Our delicious Gluten, Onion and Garlic free Sweet Potato burger are a wholesome, satisfying combination of freshly prepared vegetables, blended with quality gluten free flour and cooked until golden brown in cholesterol free rice bran oil. Chilled and vacuum packed for optimum freshness. Easy to prepare - grill, pan fry, BBQ or sandwich press. Delicious served with salad and your favourite home made relish, chutney or sweet chilli sauce. These burgers do not contain any onion or garlic. No regular potato, eggs or dairy. No added salt, artificial colours, flavours, preservatives or MSG and are peanut and tree nut free. and cooked until golden brown in cholesterol free rice bran oil. Very easy to prepare - simply grill, oven, pan fry, BBQ or sandwich press. and your favourite home made chutney or sweet chilli sauce. Store vegiefingers in the fridge until the use by date or freeze for up to 12 months. flavours, preservatives or MSG and they are peanut and tree nut free. Great for kids.